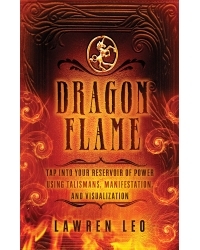 Dragonflame is a new and powerful philosophical system that sets forth a magickal equation for achieving spiritual transformation and manifesting one’s desires. From insightful meditations and visualizations to magickal exercises and rituals, this book offers spiritual guidance, with beginners’ instructions and advanced practices that will help both novices and adepts achieve transformation in an understandable and reader-friendly format. Create talismans to tap into and control personal power. Find and manifest your dreams. Discover new paths for magickal and spiritual development. Make your magick work in a karmically correct fashion. Find and begin creating the metaphorical Philosopher’s Stone. Lawren Leo attended Lynn University and Pepperdine University. Since then he has traveled throughout the United States, Great Britain, Western Europe, North Africa, and the Middle East, studying esoteric philosophy, magickal arts, and alternative religion, and giving readings. He has been practicing Wicca and High Magick and studying Qabalah for nearly three decades. Presently, he owns a metaphysical boutique called New Moon Books, Crystals & Candles, Inc., in Pompano Beach, Florida, where he also resides. He is also contributing author and editor at the electronic magazine The Familiar and can be reached at www.newmoonbooks.org.